"A lovely hand painted Coronet Ware art deco trio for that pretty deco dresser space or display niche. Made by Parrott & Co. this is a wonderful 1930s Staffordshire art deco trio: desirable both in terms of art deco collecting and display. 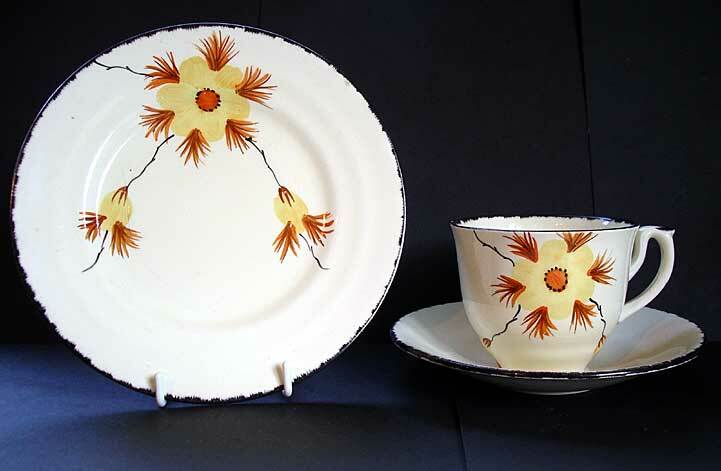 It dates from the Clarice Cliff period of Staffordshire Art Deco production. Unfortunately, we do not know who designed the fabulous Monkey Tree pattern for Parrott? Several names come to mind but no firm evidence as yet... So please keep those emails coming." Antiques Expert Hamilton Bear. Dimensions: height cup 70 mm max. width tea plate 175 mm max. Condition: Excellent condition for display with good fresh looking decoration with no fading. 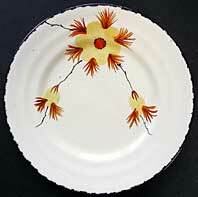 No significant defects, in terms of: cracks, chips or restoration.